Tah daahh! Here it is, the finished costume! 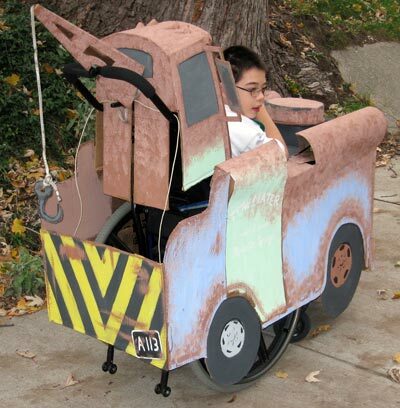 A well-deserved round of applause for David B., who guessed it correctly: the character Mater from the movie Cars. As usual the costume-building took until the last possible minute (read 3 a.m. Hallowe’en morning). 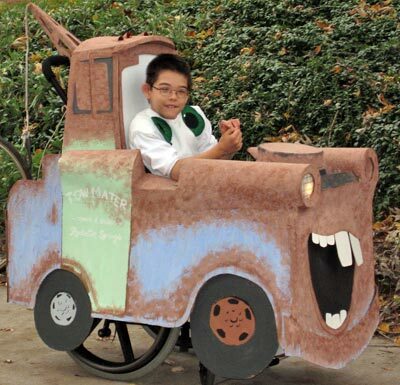 Jon’s school scheduled its costume parade at 11 a.m.; we had to drive it into the school separately because there’s no way it could’ve fit on the bus! The costume parade at Jon’s school. These pictures were taken late afternoon while the sun was still up so you can’t see the working running lights at the top of the cab. Detail of door and eyes. If Jon had shown up at our place, we’d have doubled the haul. Awesome! Even better than the guy we saw with the glow-stick powered Tron costume! Way to go Mom and Dad!! Awesome does not even come close to describing it. Sniff – I want one too! TOTALLY COOL!!! I saw it live and in person and it was awesome. Awe. Some. Way really. 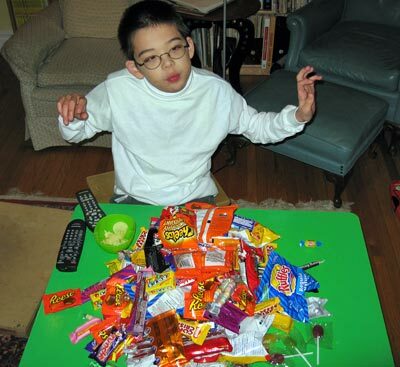 I went trick-or-treating with them and the neighbourhood was mightily impressed. That show was the only thing that rivalled Jon’s costume. And that neighbourhood goes all out. Oh my god, this is BRILLIANT. Incredible…but then, that’s simply what we’ve come to expect from you people. Can I hire you next year? Pleeeez? ps my Honda’s getting old….can you do something…a cool cover? Yeah I promise if you make me one, I won’t outgrow it! 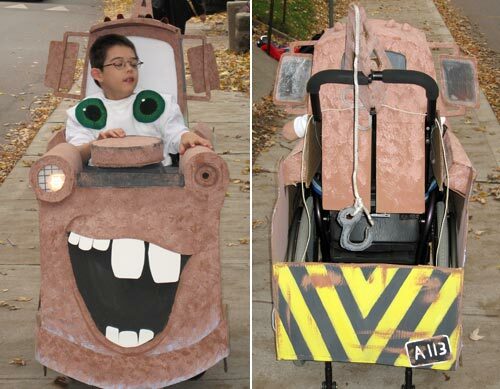 That is either (A) a set of parents that REALLY love their child or (B) a set of parents REALLY into costuming at any excuse! (Or maybe both.) Bravo and congratulations to the lucky little boy. Very impressive. Peter’s often said that putting so much work into something that will just go out in the paper recycling the next week is our version of the buddhist monks’ sand mandalas—spending days making beautifully intricate patterns of coloured sand, only to destroy them at the end. 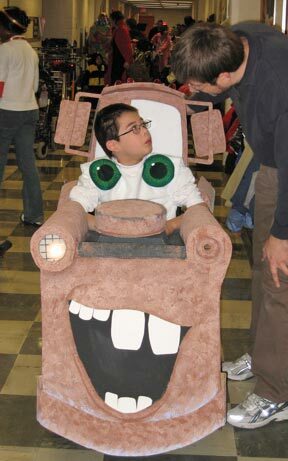 But just in case we don’t have to, anyone want a slightly-used Mater wheelchair costume? 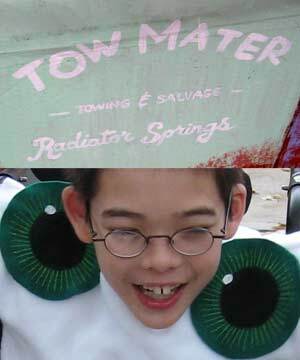 Maybe there’s a children’s hospital or hospice nearby that you could give the costume to? Jon was definitely the KING of the SunnyView parade. Everyone is still talking about how amazing this was! So, are you trying to impress the “new” teacher? I know this “old” teacher was suitably impressed!! It’s taken me this long to reply because my jaw dropped in awe. Unbelievably brilliant and well-crafted!!! You said the production down the street may eventually collapse under the weight of it’s own expectations, I’d say you are building your own weight pretty high as well. Amazing job. You’ve certainly got the spirit. After a mad dash around town for candy (Dawson was critically short) I had a total of five kids come by that was the extent of my effort. Hey, you don’t need to throw it out! Donate it to a school or a children’s group or me, if I had the space for it, which I don’t so don’t, but you get the idea. Andrea, David, the costume wasn’t built to last. It’s made of cardboard and glue and paper tape and poster paint. Heck, I was just hoping it would last the night and I know it wouldn’t if it had rained. It was built around Jon’s specific wheelchair, tray and seat at his current growth settings, it isn’t one size fits all. As for the weight of expectation, yeah I know. But Jon’s ten, and there’s a finite number of Hallowe’ens left him to participate in, and there’s always the hope that next year he’ll want to go out as his own clone, or The Wheelchair Ninja, or something. An aside: Jon was quite shy during the school parade, when there was a lot of appluase and encouragement shouted to him. Although he knew what the costume was, we realized that as the wearer Jon couldn’t see the sum of the parts, so he couldn’t figure out why he was the centre of attention. We went to the full length mirror in the school’s physiotherapy dept, and that’s when Jon suddenly became delighted. That night, he was outgoing and firm, and knew he was the costume. To anyone who didn’t know: “I’m Mater. From the movie Cars .” It made all the difference. You guys are AMAZING ! Jon is one very lucky child to have such devoted and loving parents, and talented costume designers/fabricators as well.